‌How do Cone Snails hunt Fish? Our studies are directed towards the identification and characterization of pharmacologically active substances which interact with ion channels. To this end we investigate the pharmacological profile of such substances by electrophysiological measurements in expression systems. The questions we ask are: „What is structurally needed to block a voltage gated ion channel ?“ and „What is crucial for the specificity of a substance for a given ion channel subtype ?“ One focus of our research is the analysis of the interaction of different cone snail toxins with particular ion channels. These studies not only imply the biophysical characterization of the interaction of a conotoxin with its target molecule but also the investigation of the physiological implications of this interaction. The purpose of our studies is to create a basis for a potential pharmacological or even clinical use of these substances. Due to the key role of ion channels in many physiological processes, substances interacting with these proteins may have a great variety of possible clinical implications. since several members of the species are able to hunt fish (Fig. 1). 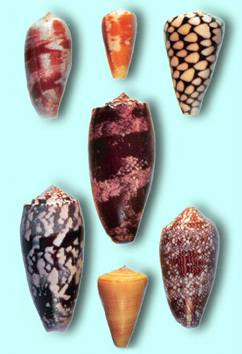 The venoms of cone snails consist of a huge variety of different peptides, the so called conotoxins. Conotoxins are small, usually cysteine rich peptides which have been grouped into several families according to the molecules they are interacting with. For example, d-conotoxins interact with voltage-activated Na+ channels, w-conotoxins with Ca2+ channels and so forth. The cysteine backbone has been shown to be very important for the function of these peptides (Fig. 2). Fig 2: Primary structure of conotoxins binding to voltage gated ion channels d-conotoxins interact with Na+ channels; w-conotoxins with Ca2+ channels; k-conotoxins with K+ channels; m-conotoxins bind to Na+ channels. Other conotoxins identified interact with: acetylcholine receptors, NMDA subtypes of glutamate receptors or 5HT3 receptors. conotoxins a very interesting tool for the investigation of the structure and the function of different ion channels. For example, w-conotoxins are able to differentiate between different subtypes of Ca2+ channels which have been subdivided into groups according to their sensitivity to various w-conotoxins. An example with k-conotoxin PVIIA, the first identified conotoxin known to block voltage activated K+ channels, may illustrate our strategy to identify and characterize the interaction of conotoxins with their target molecules. k-PVIIA from the fish-hunting snail Conus purpurascens consists of 27 amino acids. It has the same cysteine backbone as d- and w-conotoxins. The role of k-PVIIA in prey capture has been established: this peptide is a key molecule for the very rapid immobilization of the fish prey by an “excitatory shock”. By using the Xenopus oocyte expression system it has been shown that k-PVIIA blocks Shaker mediated K+ currents with an an IC50 of about 100 nM. The Shaker K+ channel from Drosophila is the first voltage-activated K+ channel which has been cloned. No mammalian channel has been shown to be sensitive to k-PVIIA yet. Residues known to be at the extracellular mouth of the ion channel pore are important for the interaction with the toxin. The binding of PVIIA to the Shaker channel is a bimolecular reaction which is state-dependent. This means that the affinity and the kinetics of the interaction of the toxin with the ion channel are different depending on whether the channel protein is closed or open. Therefore the conformational changes ion channels undergo during their activity can also be of major importance for the binding of a ligand. Furthermore, the affinity of k-PVIIA to the closed state of the channel depends on the extracellular K+ concentration indicating that the extracellular milieu is important for the interaction. These results demonstrate that the interaction of a pharmacologically active substance with a voltage gated K+ channel not only depends on the structure of the molecules but results from an interplay of many parameters.